I hope everyone in USA enjoyed their long weekend! I sure did... it gave me a chance to catch up on all kinds of things. Fat Quarter Shop is here today with a giveaway! FQS is one of the first online shops I ever purchased from & their service has kept me a customer over the years! Same day shipping... great selection... and a human being on the other end of the phone should you need to call. They specialize in all kinds of pre-cuts & always have the best new lines out there. In addition they feature a large selection of fabric on the bolt. If you are looking for a specific print for a new project... chances are they have it. It's a yummy mix of spring & summer colors! Check out Fat Quarter Shop's extensive "Coming Soon" page and let me know what you are most excited about! That's an easy one. It's the going coastal line that is coming this months. Amelia is my favorite...thanks for the giveaway. I love the look of Pear Tree - so fresh and yummy! I love the blogger's choice sets! They all look great. I think I will definately be buying some of that Amelia line by Me and My Sister. I saw a quilt made with their first line and now I wish I could buy that, too. I love Aunt Grace's Garden Party. Great Colours and cute prints. Thanks for the giveaway! Hometown by Sweetwater, I just love this collection. Blue Lagoon Batiks - yummmmm. Daisy Cottage looks beautiful. My color favs are in there. I've been waiting for Amelia by Me and My Sister Designs forever! Can't wait till its available! Thanks for the chance! Have a super week! Easy...Joel Dewberry's "Heirloom" and i would use it to make your Chopsticks pattern!! Holy Cow! There are so many I cannot remember all my favorites! I think Bali Pops.....any one of them. Also flipped for Kate Spain's Designer collection from Terrain augmented with some solids. Thanks for another great giveaway Julie! There are so many great fabrics coming out! But I can't wait to get some Butterscotch and roses, and some Ruby...I am loving the new kids lines too! I need some Dr Seuss and Meadow friends! I'm most excited about more Lizzy House Pearl Necklace coming out with the Outfoxed line. Yay! Hmmm, I spy a custom bundle from you that looks pretty great! I am also interested in checking out Children at Play. Thanks! Julie Herman's Blogger's Choice... of course. But also Aunt Grace's Garden Party and Over the fence Children at Play. So many great fabrics! Wow, what a beautiful bundle! I am most excited for the Children at Play collection; it is light, fun, and has fabrics included that are perfect for my girl AND boy. Thanks for the chance to win! OOHH - Blue Lagoon Batiks and the new Bali pops - love Hoffman batiks!! There are some interesting new books, too. I just love Fig Tree - so the Butterscotch & Roses will be a must. Julie, you always have such awesome giveaways! Thanks for the chance. My favorite "coming soon" fabric is Butterscotch and Roses by Fig Tree. Yummy! Yes, I had a great holiday weekend too Julie! My favorite from the Coming Soon page of the Fat Quarter Shop is TAZA by Dena Designs...I can think of a few great things to make out of that beautiful fabric. Your blogger bundle looks really neat....... what a great idea. I am happy to see "Hometown" and Terrain..... thanks! Hometown - hands down! But of course I love oranges/blue combinations so that would mean your bloggers choice bundle too. actually i love the color palette of your blogger choice FQ bundle. i also love the look of baby safari and choo choo you. I looking forward to Amelia Cotton Yardage Me & My Sister Designs for Moda Fabrics! Thanks for the opportunity to enter your giveaway! So many things I could do with a fat quarter bundle. Bonus that it's Amy Butler's. daisy cottage, bold designer solids, soft designer solids, blue desired things, taupe desired things, horizon morning tides and mystical morning tides. I'm looking forward to Ruby! Boys at work! Perfect for my son. Oh how I love the Fat Quarter Shop. I am most looking forward to Circa 1934. I love the colour combinations. It was very hard to choose too. I'm dying to get my hands on some Cosmo Cricket Circa 1934. I'm playing around with a Jelly Roll now as part of a project I'm working on for Moda Bakeshop and I can't get enough of it, I "need" more...hahaha. Terrain is what I'm most excited for. Far Far Away III by Heather Ross. Thanks for hosting such a wonderful giveaway. The Baby Safari caught my eye. Thanks for a chance to be a winner. Circa 1934 looks really good! Two faves are Amelia and Aunt Grace's Garden Party. Lovely fabric bundles. The Marvel comics prints look awesome! I may go broke buying that up for all my friends and my son. A friend of mine is nuts for Batman and those look super fun too! I'm looking forward to the book More Layer Cake, Jelly Roll and Charm Quilts Book by Pam & Nicky Lintott. I like the blogger's choice sets and the new Central Park fabric! I'm waiting for "Secret Garden" by Sandi Henderson. She's one of my favorite designers and I love the new line! 1. Schnibbles 2. I have the first one and love it. The Marvel Retro Comics fat quarter bundle, for sure! There are so many girly prints out there and not nearly enough for boys. Holy guacamole! That was quite a chore, but a pleasurable one. There's so many to choose from, but I guess I'll have to settle on Citrine Heirloom by Joel Dewberry...or...Lively Fresh Fallen Snow by Kris Lammers...or...! I love the Lime Twist Emma. Teal/aqua is my weakness lately and that line looks great! I've been anticipating Terrain for what seems like ages! And I have just recently seen Pinfeathers which looks cute! The bloggers choice sets are very cool ... should be fun to see. 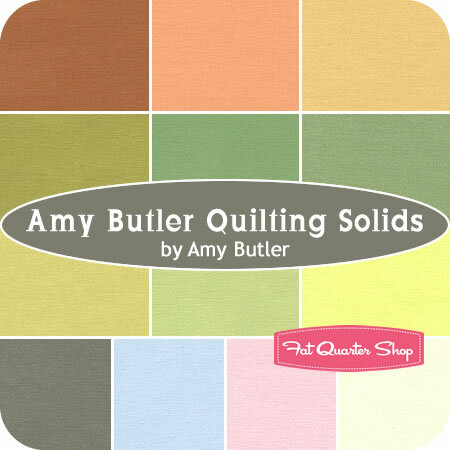 I'd love these solids to put with my little stash of Amy's prints - thanks for the chance to win! Baby Safari is adorable, and I love the bloggers choice collections! Beautiful colors:) I am super excited for Moda's Ruby Collection.....so pretty. Love Terrain by Kate Spain! I am Loving Little One Organic. I need to make twin quilts one boy and one girl and I think these would be nice. I love so many, but the one that I know I will use is the Sports Life lines by Robert Kaufman! Definitely plum pudding Bali pops. Yummy! Thanks for the giveaway! That Amy Butler pack is awesome. I love, Me & My Sister Designes and Pink A Doodle and Good Night Spot too cute. What a great giveaway of beautiful Amy Butler Fabric! I love the Buttons and Blooms and the Northcott Central Park. Oh, there are sooo many to chose from. I especially like the new Sarah Jane's fabrics, Aunt Grace's, Butterscotch and Roses, Daisy Cottage is adorable and so is Delighted. Oh, and Fairy Tale Friends!! And I can't forget Ruby! Flora has got some beautiful colors and I would love to try your quilt pattern- Off the Rail!! See, there's just too many!! :) Thanks for a great giveaway! Wow, so many that I love, but will choose Whitewash by Meg Hawkey of Crabapple Hill for Lecien Fabrics. So pretty! There are just sooo many! I pick Garden Verandah by Amanda Murphy. Thanks for the opportunity to win this! What a great give-away! Thank you for the opportunity! It was difficult to choose, so many many new fun material,but the Floral Collection Rocco and Sweet by Lecien Fabrics is amazing. It's just a hard choice but I'll go for American Banner Rose. Thanks for the chance. I love the Amelia line. It has flowers, stripes, and dots. What more could a gal ask for? I am most excited about Terrain by Kate Spain for Moda. It was so hard to pick though! So many great lines! I'm psyched for the Marvel Retro Comic fabric, pretty much just for the Hulk! Hands down it's Kate Spain's Terrain. I've been super excited for it ever since I first saw pictures. September, argh, you are too far away! I like your Blogger's Choice bundle! Love those colors together! Heirloom in Ruby...love Joel Dewberry. Oh that Boys At Work fabric looks amazing - we have a little boy that I need to do some sewing for! I am excited about the Organic Soul Blossoms by Amy Butler! Its beautiful! Love the solid fabric giveaway! thank you! It is so hard to choose just one, but I'm super excited about Fairy Tale Friends from American Jane. I missed the Pez fabric the first time around, that won't happen this time! There are sooo many, but two I really can't wait for...Terrain and Puttin on the Ritz. Amelia from Me and My Sister. Thanks for the giveaway. Marvel Retro Comics. Thank you for the opportunity! I'm so excited about Kate Spain's Terrain! I really like your fabric collection. I might have to fall off my wagon for that one! I like the look of critters for my little people and Aunt GRace's Garden Party for me! thanks for the chance. Oh!!! There are gorgeous !! Just to look at them!! !I wish, I wish we had such a shop here :( Life would be such a pleasure then!!! with out the hazel of matching so much !! Can't wait till Going Coastal is here! The Blue Lagoon Batiks caught my eye pretty quickly! Thanks for the opportunity for a giveaway! Farm Friends by Jamie Wood! Oh it has got to be "Baseball Sports Life". I love so many others, but I have two boys and it is so hard to find sports fabric! I can't wait for this to come out! I can't wait for Moda's Ruby. Love the colors. I was searching through my stash this weekend thinking I need more solids, so thanks for the chance to win these yummy pieces. I love bright fresh colors so my favorites are Lime Twist Emma and your Blogger's Choice Pack - the orange grey and turquoise are a total combination of my favorite colors. So many interesting choices -- but I think, for now, I really like "Coming Home." There are a few but the one I am really looking forward to is Riley Blake's Farm Fresh. Thanks for a chance to win! There are so many things to choose from, but I think Butterscotch & Roses by Fig Tree Quilts is the one I'm most excited about! Another great giveaway! I really like the bright colours of Amelia. Also looking forward to Decadence. And truthfully, your Blogger's choice are my favourite colours. Thanks for the chance to win some solids - I really need some. I am excited for far far away III by Heather Ross! Her fabric is always so cute!! LOVE the Julie Herman's Blogger's Choice Fat Quarter Bundle, The Daisy Cottage line (due with a little girl in a few more weeks), Prairie Farm Fresh (for the unrealized farm girl stuck inside of me) and I could go on forever - lots of beautiful fabrics to look forward to! Great prize, I never have solids, so thanks for that! had to stop there, I'm going to have to remortgage as it is to afford all this lot! I'm excited about the Children at Play collection! It's so cute! hard to pick one - love the new central park - not to be confused with kate spains central park. But I am still holding out for the terrain by moda. What am I most excited about? Easy. TERRAIN! So hard to pick just one! Farm Fresh by Riley Blake is adorable, but then I love anything Lizzy House and Outfoxed looks great. I might have to go with Secret Garden by Sandi Henderson, though. Thanks for the giveaway! I'm excited a lot of things on the page...it's hard to name just one. I like the blogger's choice selections, particularly yours and John Adamss. Also like the Amerlia Cotton fat quarter set by Me & My Sisters, Baby Safari....I got tired of writing down all the ones I wanted! Oooooh....that Hometown Canvas looks awesome. I am looking forward to the Hometown line by Sweetwater! Butterscotch and Roses by Fig Tree. Thanks for the giveaway. Wow! So many wonderful, delicious colors! But if I could only choose one, I love Aunt Grace's Garden Party. Thanks for the giveaway! I like the Amelia line but the bloggers choice bundle look fun, too! I am a true "Schnibbles" fan so I would pick "Another Bite Of Schnibbles" quilt book! Thanks for the invite to join the contest. You can never have enough solids in your stash. Hometown is first on my list! Thanks for a chance to win. YEA! love giveaways! thanks so much. The Boys at Work fabric line is perfect for my boys. Thanks for the giveaway! I'm torn between Baby Safari fabric and the Boys at Work fabric. Both are so cute! I like your Blogger's Choice fat quarter pack - nice selections! Butterscotch and Roses might be the perfect combination for a quilt for my MIL. The Storyboek collection also looks so sweet. Definitely Curio by Basic Grey (for Moda). Sweetwater Hometown! Love those colors and always love a little text on fabric. I would love to win that yummy FQ bundle. I'm not sure if I would keep it for myself or give it to someone special. Sweetwater Hometown is what I'm looking forward to! I'm looking forward to Joel Dewberry's Heirloom collection...so pretty! Thanks for the chance to win! Love these colors in the bundle. I am most excited about Marvel Retro Comics fabric. I read a lot of comic books as a girl and so these novelty prints give me such great memories! I am excited for the next Schnibbles book to comeo out. I have had so much fun with the first one. Daisy Cottage looks lovely. Thanks for the chance to win! I didn't realize a 2nd Schnibbles book is coming soon. Can't wait to get my hands on that as well as Sweetwater's Hometown line. Good stuff! Your blogger's choice pack, of course! No, seriously, that is what caught my eye without realizing that it was yours. I think I might have to order me one. Oh man, you had to make us go look! Now I have a list. Uhmm, Fairytale Friends and Going Coastal are at the top. The Lime-Twist Emma and Pink-A-Doodle Emma. I love fat quarter shop, and could never pick just ONE thing from the coming soon page! I want to work with Bittersweet, Butterscotch and Roses, Delighted, and I just saw Emma, coming inNov. So exciting,thanks for the giveaway! Definitely Terrain - it is so beautiful! Oh and someone mentioned Going Coastal - gotta get some of that crabby fabric! Thanks! So many! Ruby, Little Apples, PKM,Baseball Sports Life, Sarah Jane and the Jaybirds bloggers choice...oh those oranges! Thanks....I pushed so many "let me know" buttons!!! Forever Spring! Love the solids! Love batiks and the Blue Lagoon Batiks are stunning! Those will belong to me when they arrive! Thanks for the giveaway! I can't wait for Hometown by Sweetwater to come out. THe colours are gorgeous and the prints are so bold and graphic. Froggin' Yardage is just too cute...added to my 'must have' list!! Since my 10yo son is next on my list to get a quilt Marvel Retro comics, is the one I am most looking forward too! Puttin' on the Ritz!! Hands down, an it needs to hurry up! Can I be excited about a lot of things? Butterscotch and Roses tops my list, but also Heirloom. Totally different but I am all about variety! Thanks for the generous giveaway!!! Thanks for the chance to win.... I want the Curio fabric line!!!! There are too many precuts that I love but Another Bite of Schnibbles Quilt Book That Patchwork Place, Carrie Nelson caught my eye first. Love those small pieces. A heartache but once done, its a beauty. Cant wait for the marvel retro comics package! Can't wait for Holiday Splendor from Hoffman... oh the richness of it! 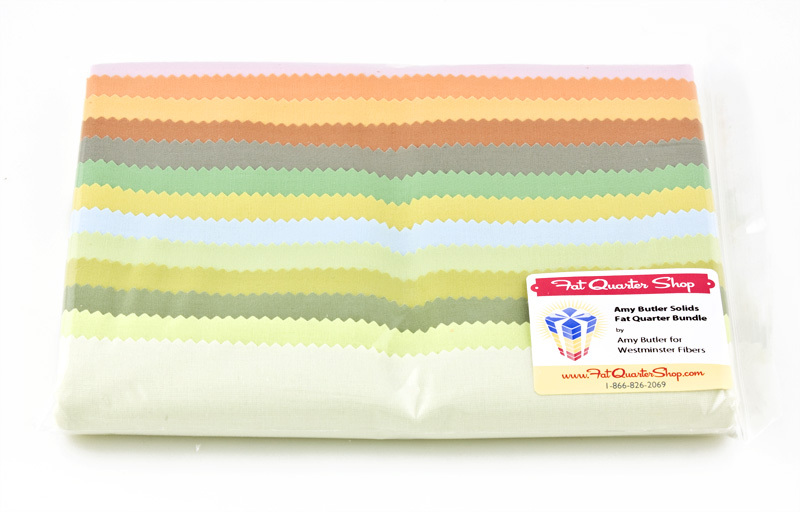 Thanks for the chance to win Amy's new solids. They are great. Amelia by Me and My Sister.......I just love all the colors. I like the colors of the Fresh Fallen Snow fabrics, and it would be fun to try something new! Blue Lagoon Batiks! They look beautiful! At first I was going to say the Sew to Swap book - I hadn't heard of it until just now, but it sounds like it could be interesting. but THEN I scrolled to the bottom of the page and saw Lizzy House's Outfoxed collection. Definitely excited to add more of her adorable animals to my stash! I am looking forward to the Key Lime and Plum Bali Pop. I love Kate Spain and her Terrain fabric. I also love your choices, grey is the new white for me! for sure bot buddies- love the robot fish! so funny! I like the look of the Taza fabric line! I have plans for Patty Young's Grand Bazaar. Terrain by Kate Spain and the new American Jane line. I love color! I am looking forward to the Jazz Cotton Club Fat quarter Bundle. Thanks for the great give away! Well, I'll second everyone else who adores your aqua/orange/gray bundle! I also was really drawn to Citrine Heirloom by Joel Dewberry, which is also in aqua/orange(coincidence, i think not!) Gee, I think I just found my new fav colorway! Today I'm loving Fresh Fallen Snow in Lively. I love the blue & green. Too many choices. I think Going Coastal by Emily Herrick of Crazy Old Ladies will be on my must buy list. Moda Fabrics because this would be a wonderful tool to have for choosing colors. THANKS TO YOU+FQS FOR SHARING! I can't believe how many things there are on their list of coming. I thought it might never end. I liked many things, but the two that I think I'd love most were outfoxed and terrain. Thanks for the giveaway. Did you see Lizzy House's Outfoxed? So cute!! OMG - I had no idea so many great collections were coming out so soon. It is impossible to pick just one! But, since I am always a sucker for Basic Grey designs, I will have to say Curio. Note to self: start saving some money! I love, love, love the Blogger's Choice fat quarter bundles!!! It’s so hard to choose just one thing I’m excited about from FQS’s coming soon page. Or anything in their shop, for that matter. They’re my go-to store. I'm looking forward to Organic Soul Blossoms and Ruby! I'm very excited for Sweetwateer's Hometown and 3 Sister's Etchings!!! Thanks for the givaway! So many great new fabric line coming out! Right now, cause that could change in an hour or two, I'm going to pick Tuxedo Collection. I really want to add some grey tones to my stash. It's hard to pick just one! "Bittersweet" and "Flower Sugar Spring 2011" both are too yummy! Very different lines, but I love them both! Get "Lazy" with me in LA!